Evening all, its been a slow week but finally started to paint something as I was getting bored with hacking stuff up. 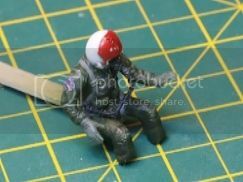 First up the pilots got a coat of finest green and I've started to add colour to the rest of the flight gear. 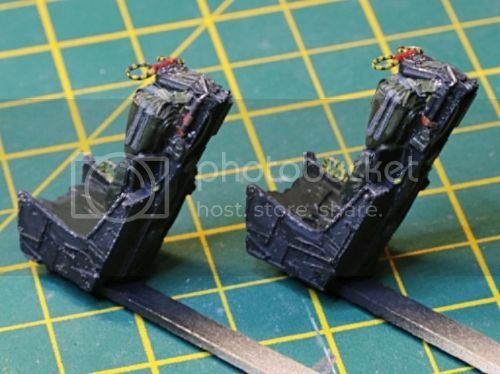 Before painting I had to chop them up a bit to get them to a similar size when seated and re-position the arms so they would be in about the right position to be moving stuff around the Legend cockpit. The poor unfortunate Master Details figures now has a backside Kate Moss would be proud of. The overhead light produces some nice contrast which I will attempt to maintain using paint. 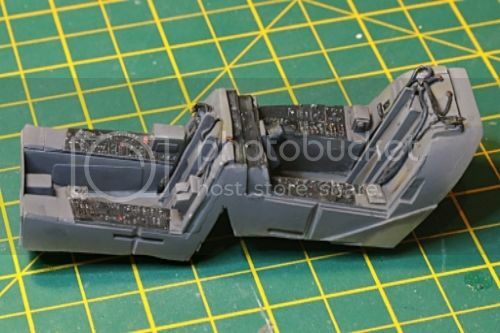 Next up is the cockpit tub which I have sprayed the grey and NATO Black on the panels. I've also started adding some shading on the grey mainly be doing darker and lighter shades of XF54. As this will be a closed cockpit I'm probably going to have to use more contrast than normal for anything to stand out. Finally, the cockpit side walls got a similar treatment. Well it's been a while but what with christmas and 3 small kids, time somewhat evaporated. Needless to say, weeks worth of present research, acquisition, and wrapping lasted approximately 14.8 seconds when in contact with a small child. Anyway to business and Happy New Year! I've focused on finishing the cockpit area as I need that complete to start figuring out how all the lighting is going to fit. 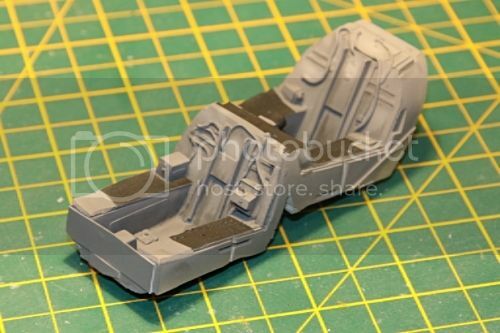 First up is the cockpit tub, though I'm not entirely sure how much of this will be seen with the cockpits shut. EXEMPLARY work updates and the flight deck and the instrument panel is looking VERY NEAT. Its really lovely work all round. Keep it coming... good job Sir. I've also had a go at the pilots IP. Because I wanted to back light the instruments I liked the idea of using the film on the Eduard set as the PE is opaque. Unfortunately Eduard only so one that fits the Tamiya kit and the size difference is quire noticeable close up. Once installed with a pilot hopefully it wont be so obvious. I've used a couple of other PE items where film allows me to add some back light with the rest of the detail painted on. The coaming was sprayed then painted with washes to add more interest. I like how it turned out so may use this technique of other parts of the kit. 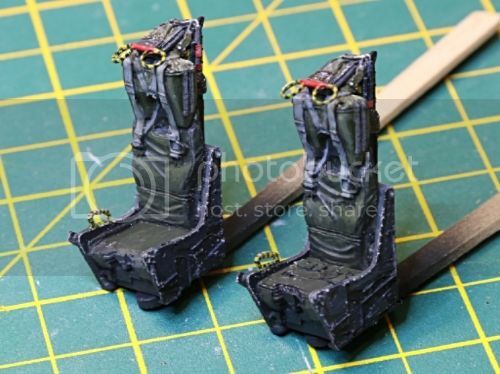 Next up seats and pilots when I get round to finishing them! I like the Cockpit and the Instrument panel DOES look OUTSTANDING. 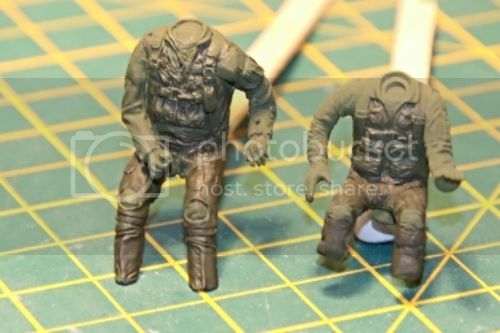 Great photos and thank you for your updates ..
One of the great things about this hobby is that if you have the time, you can and lose yourself for hours in it even though the the results are not always proportional. 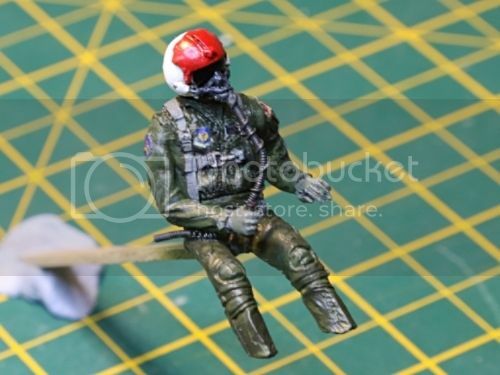 I spent a couple of hours working on the Ejection seats but when the wife asked me what I'd been up to I felt Id just started and didn't exactly have much to show for it! Anyway they are more or less done. 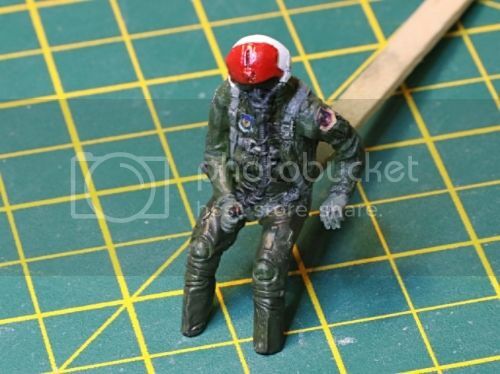 I've modified one of them to allow the Master Details figure to fit properly and have yet to add the additional straps that attach the pilots to the seats. 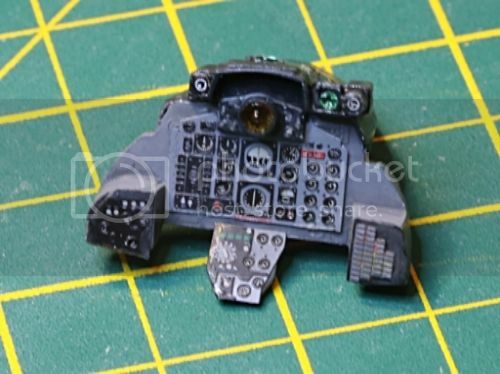 Error #5 - I managed to break off some of the detail on the lower LHS (an emergency Oxy handle I think) getting the pilots to fit but I figured you'd need a surgical camera to spot the offending item is missing when its all buttoned up. I added some Eduard PE for the EJ seat placards but they weren't a great fit and I managed to dislodge one into the carpet somewhere. Despite many minutes of adopting the 'praying to the Axminster god' position it still remains illusive. I must have the parts to a whole kit strewn across the floor by now. Oh well, Pilots next! A tip I learned years ago when the carpet monster ate" freshly cut from the sprue parts" was to tape a section of women's tights (nylons) over the end of a hoover pipe and then vacuuming over the carpet. If I was lucky the offending part stuck to the nylon and I was spared having to scrap my model or try to scratch build the part. My mum and sisters couldn't at first work out what had happened to their tights but when they eventually found out it was me, ouch is all I will say. Great tip Victor, I'll remember that for next time! Though I'll probably consult the oracle before hacking her wardrobe to pieces. ................the 496 TFS from the 50 TFW, USAFE based at Hahn AFB, Germany circa late 70's using the AirDoc book and decals as reference. 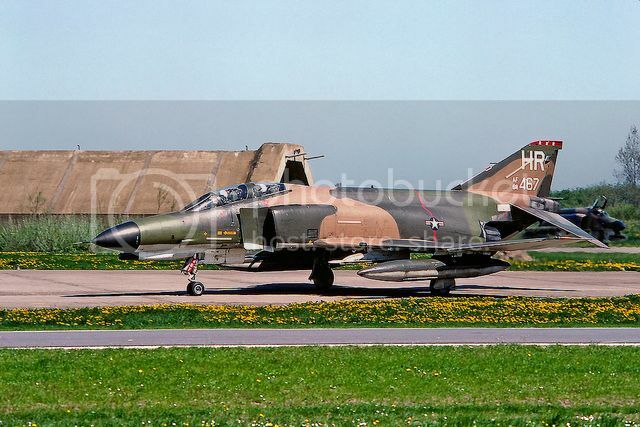 If anyone has some piccies they'd care to share of this unit when it was operating F-4Es it would be great to see them! The jets have a red fin top and I've seen some photos where the aircrew have a red visor cover so they both get one as you can't beat a bit of colour in the cockpit. 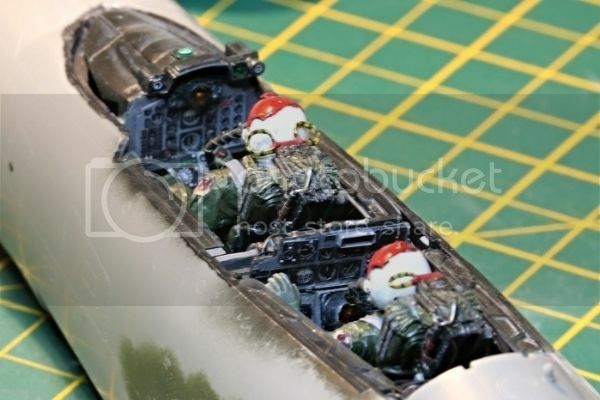 Having looked at a number of images I believe the canopy frames where they meet the fuselage were black rather than red as in the AirDoc book but if anyone can confirm that I'd appreciate it! 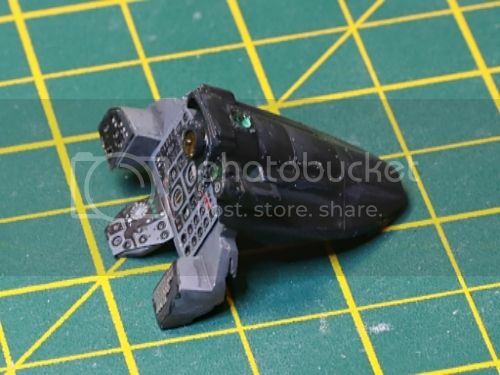 With most of the cockpit items now painted its time to start on the fibre optics and lighting, I sense another learning experience coming on. 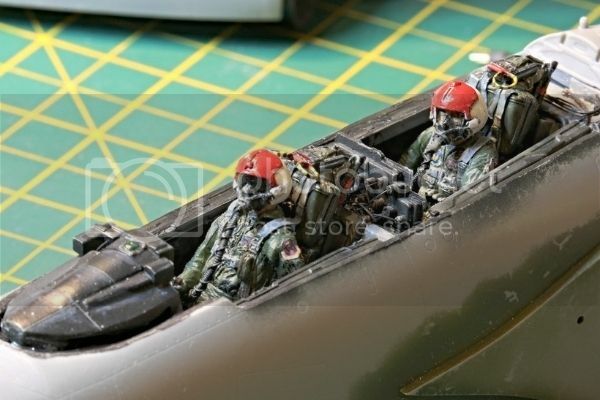 Wow, Richie, those ejector seats look terrific and the detail painting on the pilots is really crisp. Great job! Thanks Jim much appreciated! This is what I hope to emulate eventually but it seems a long way off yet. Well its been a while however things have progressed a little bit. 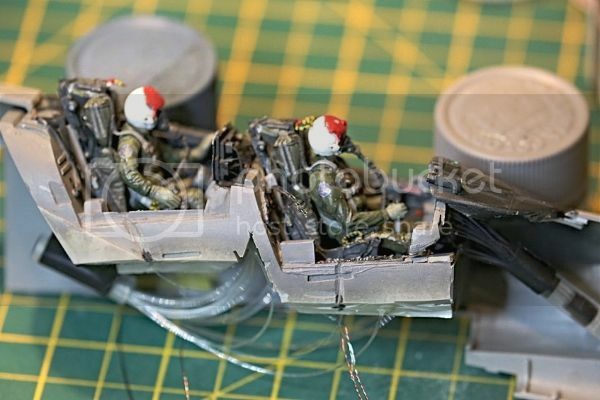 Actually I spent a fair amount of time working out how I was going to structurally reinforce the fuselage and fit in all the lighting gubbings, I think I'm going to end up with more wiring than the real thing! 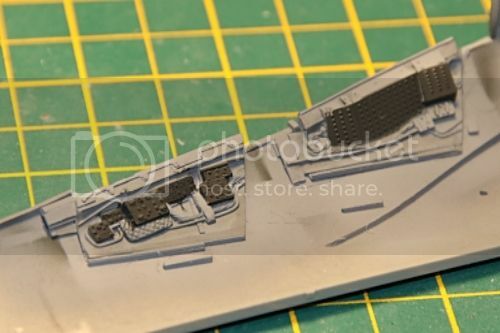 First up is the reinforcement I made to the rear fuselage which has to take the full weight of the aircraft plus all that resin at the front through the engines. 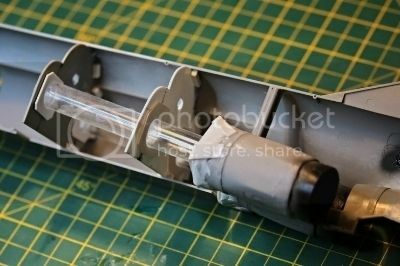 The clear acrylic tubes will take the rods that will support the jet in flight so I've created 2 bulkheads using a Revell part and a new build. These have been reinforced where they join the fuselage and where the tubes run through. Two holes where then drilled though to provide the correct alignment for the exhausts. 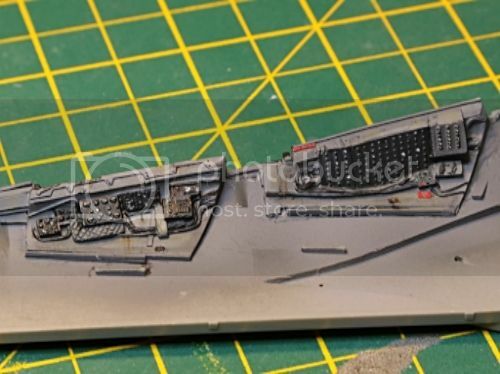 This was by no means easy to judge as the engines are not parallel to the fuselage and the Revell fuselage needs to be pushed out a little to ensure it meets the underwing/fuselage part which means the exhausts will not be centric unless you allow for that. As it was I was a little off on the width of the separation between the two exhausts but with the exhaust nozzle on you can't tell. The tubes pass through the rear of the exhausts so I reinforced them as well. The overall effect is pretty sturdy so hopefully this will be sufficient to hold her steady without crash diving into the nearest bin. 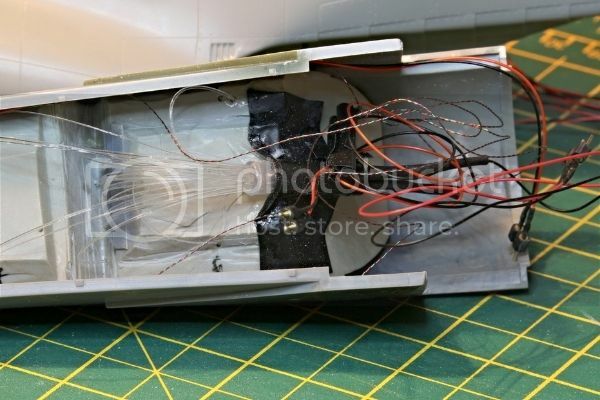 I also drilled some smaller holes in the bulkhead to allow the wiring to pass through to the tail. 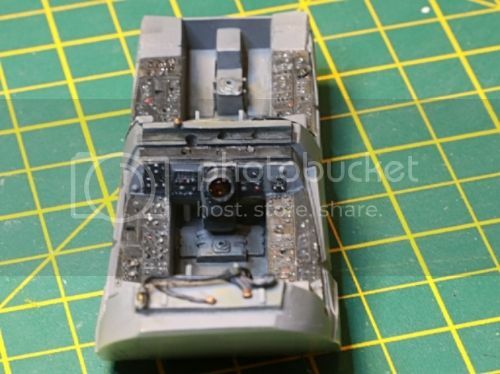 Last detail was to add a small gauge behind he window in the rear right fuselage. Its not accurate but it looks better than a black hole! Next up, cramming 8 miles of wiring into a 2 inch gap. Time to light her up! First up I've had to string the fibre optics to the back of the instrument panels which also cunningly served as the wires out the back of the WSO panel. I then had to bunch them together and attach a 3 volt LED to the back. I've gone for warm white as the cold version looked a little too blue. The LEDs are wired so they can be plugged in later to the power supply which makes the soldering a bit simpler, a task that seems to take me twice as long as it should! There's one LED for the front cockpit and one for the rear. I've also added some wander lamps to help lighten the cockpit. 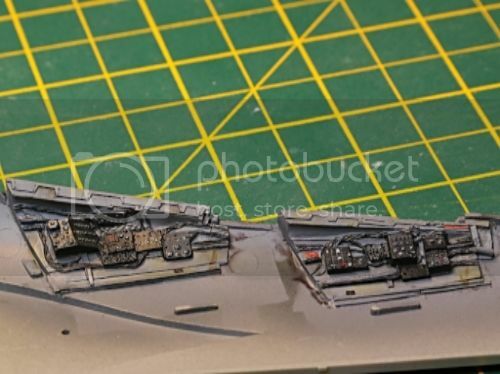 They are not strictly accurate as I've put four in to even light both cockpits but they're tucked out of the way so are not that visible. As you can see, thinning the Legend cockpit down a lot has helped provide space to fit the wiring. Having sorted that out I've now managed to glue the front fuselage halves together including the Sierra Hotel Nose which was an excellent fit. 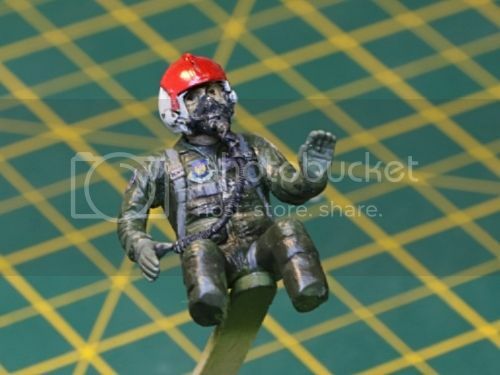 Error #6 - In my man handling I managed to break off one half of the WSOs EJ seat pull-ring and the top of the WSO IP. Perhaps I should have left them off until putting the canopies on but I just wanted to see what it all looked liked when put in place! Patience dear boy. At least they're starting to look the part! I now need to sort the tail end lighting out and add some details before joining the two halves. 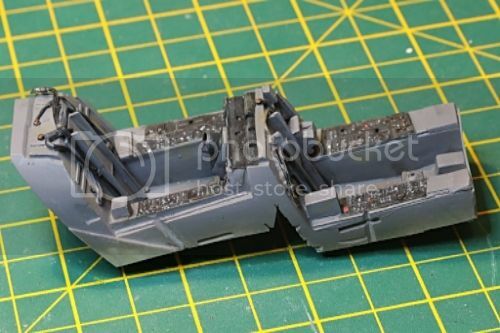 I'm trying to do as much as I can in sub-assemblies as this is one monster of a kit when its bolted together. Stay tuned!